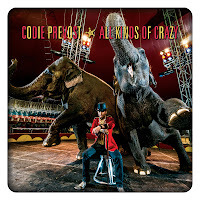 Codie Prevost "All Kinds Of Crazy"
Canadian country singer Codie Prevost is set to release his fourth studio album All Kinds Of Crazy on 1st March. Codie is a three time Canadian Country Music Awards nominee and five time Saskatchewan Country Music Association "Fans Choice Entertainer Of The Year" winner. Title track All Kinds Of Crazy starts with a electric guitar riff and vocal hook that immediately sets a party tone to the track. Whilst the production is quite heavy you don't feel as though Codie's vocals are overpowered at any point throughout the track. Lyrics such as "with a house full of party, speakers full of music" and "we'll keep it rocking until the dawn is breaking" create a great good-time imagery and I imagine the track is great to hear performed live. Second single Someday has less of a production than All Kinds Of Crazy and shows a different side to Codie whilst still following the same sound. Album closer and lead single Last Night All Day has a relaxed, Uncle Kracker feel to it that I am sure will make listeners play it on repeat. Mainly led by electric guitar and drums, the overall production builds well throughout the track. Codie seems vocally at ease throughout the track and his vocals are very strong. Down The Line is also another strong track and is probably my favourite on the album. The stripped back vocal beginning is a gem that showcases Codie's vocals really well and a similar instrumentalisation is used throughout the verses. The production levels build for the chorus and add to a well delivered vocal performance. "I hope the roads that we take collide down the line" is in my opinion a particularly strong lyric and the story behind the lyrics is well thought through. Having not heard Codie's music before this release was bought to my attention I didn't know what to expect and I was pleasantly surprised. Overall I would say this is a very strong album and I hope that Codie's popularity continues to grow. He has a very strong voice that lends itself to the rockier side of country music and I'm sure will appeal to many listeners. I was happy to see that I didn't come across any tracks I continuously skipped however I did find myself wanting more of a stripped back instrumentalisation at points throughout the album. I'd be interested to hear some of these songs with less production, Codie certainly has a strong enough voice and he should be able to feel confident with the spotlight that less production will inevitably show on a vocal. All Kinds Of Crazy is definitely worth a listen! Labels: Codie Prevost "All Kinds Of Crazy"